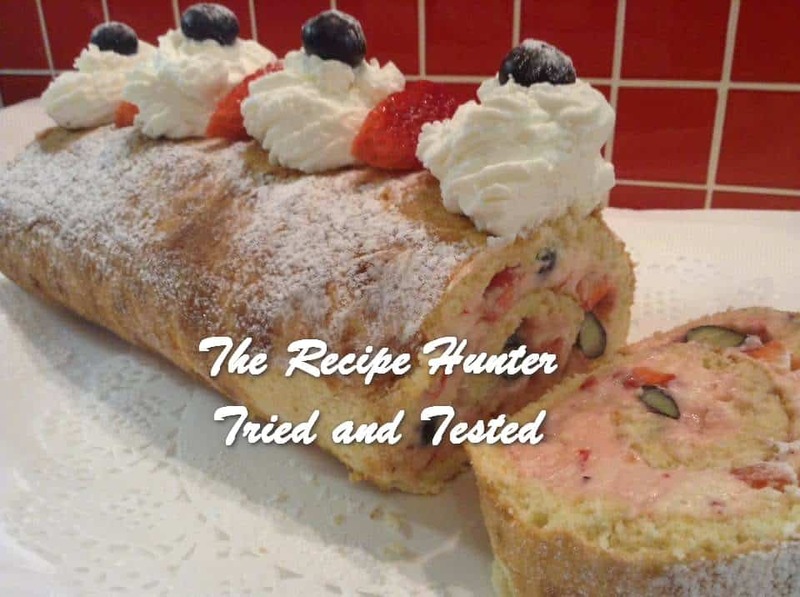 Berries and cream cheese, all wrapped in a home-made swiss roll – what a treat! Line a Swiss Roll tin with parchment paper. Separate 5 extra-large eggs. Whip whites until stiff. Set aside. 1 cup castor sugar for 3 mins until pale & fluffy. 1 Tbsp canola oil, beat a further min. Add dry ingredients to egg mixture folding in with a metal spoon. Add egg whites and continue with gentle folding until all combined. Pour into prepared tray, bake for 10 min or until done. Invert onto a clean dish towel. Remove parchment paper. Stir until dissolved, then glaze cold Swiss roll with this mixture. 1 cup icing sugar and beat for 3 mins until pale and smooth. Add a few drops pink food colouring. Add 1 cup whole blueberries and 6 chopped strawberries. Smear filling over cake and roll up tightly. Decorate with whipped cream & berries and dredging of icing sugar.